From now, the search for real estate becomes more comfortable with new real estate mobile app by RealtyWW. 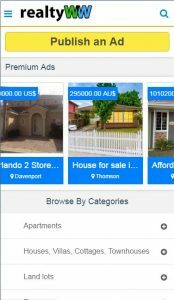 Browse real estate listings or submit your property ad to worldwide for free. Enjoy property lookup on international real estate website RealtyWW Info using real estate search app.